Monday March 27th 1922 I read and made some tatting in forenoon. Hattie and I went out to Mildred McCallisters in afternoon and I went to town for treatment. Cora and Eleanor washed in forenoon. Hattie and I down to Otts in evening. I was very tired tonight. Wrote Ida. 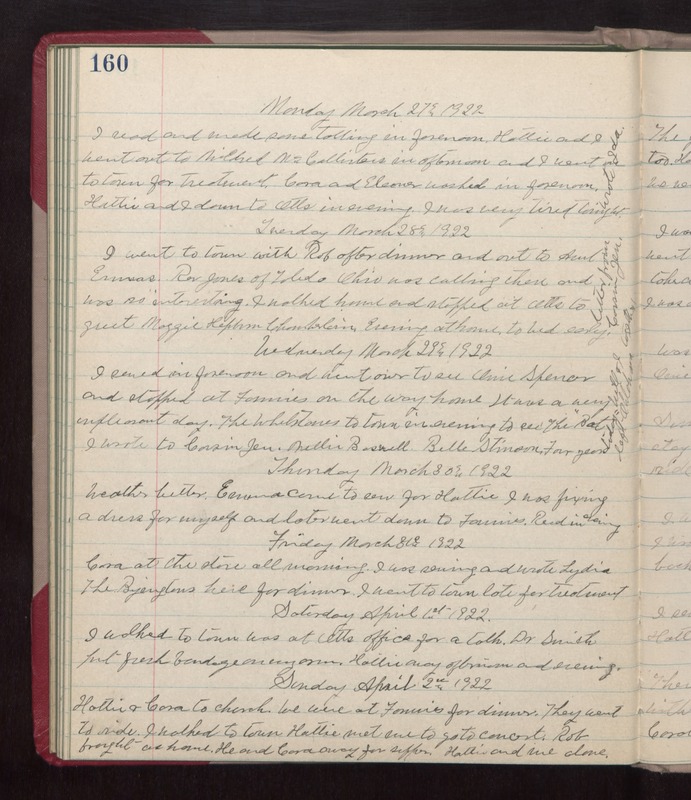 Tuesday March 28th 1922 I went to town with Rob after dinner and out to Aunt Emmas. Rev. Jones of Toledo Ohio was calling then and was so interesting. I walked home and stopped at Otts to greet Maggie Hepburn Chamberlain. Evening at home. to bed early. Letter from Cousin Jen. Wednesday March 29th 1922 I sewed in forenoon and went over to see Orie Spencer and stopped at Fannies on the way home. It was a very unpleasant day. The Whetstones to town in evening to see "The [Bat?]." I wrote to Cousin Jen, Nellie Boswell, Belle Stinson. Four years today Will & I left Oklahoma together. Thursday March 30th 1922 Weather better. Emma came to sew for Hattie. I was fixing a dress for myself and later went down to Fannies. Read in evening. Friday March 31st 1922 Cora to the store all morning. I was sewing and wrote Lydia. The Byingtons here for dinner. I went to town late for treatment. Saturday April 1st 1922 I walked to town. Was at Otts office for a talk. Dr Smith out fresh bandages on my arm. Hattie away afternoon and evening. Sunday April 2nd 1922 Hattie & Cora to church. we were at Fannies for dinner. They went to ride. I walked to town. Hattie met me to go to concert. Rob brought us home. He and Cora away for supper. Hattie and me alone.